Follow the extraordinary lives of creators, inventors and entrepreneurs; Find out what it takes to become one. Want to host a screening of Creatorland? entrepreneurship; as well as share challenges of the entrepreneurship journey. Oftentimes, a glittered experience is shared on screen based on extremely successful cases like Mark Zuckerberg, Elon Musk, Oprah etc. As a serial entrepreneur, Zainab aims to share real stories that will inspire aspiring entrepreneurs to go out and work hard to launch their entrepreneurial pursuit. Think Creatorland is the ideal documentary to screen at your school, work, or event? Connect with us and we would be happy to partner with you to screen Creatorland at your next event. In the world today, 90% of startups fail. Creatorland is a documentary series asking: what does it take to be an entrepreneur? Volume 1 follows the lives of creators and inventors - from fashion designers and storytellers to tech startups - exploring why they do what they do. Learn the unfiltered truth about challenges these individuals face, and what gives them the unwavering will to succeed. 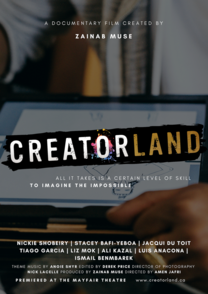 Led by an award-winning director, Creatorland proves we can all discover our innate creativity and transform them into businesses. Jacqui Du Toit uses the art of storytelling to bridge the gap between her home in South Africa and her new life here in Canada. Although storytelling might seem like an usual business, Jacqui takes us on a journey through how she makes it work. Dancing professionally requires a high amount of perseverance and work ethic that is typically not showcased. Up and coming dancer and social media influencer, Tiago Garcia takes us on a journey through his process of converting dance into a thriving business. Growing a tech company in a world that is technologically advanced can prove to be very challenging but the founders of Wandure, Ismail Benmbarek, Ali Kazal, and Luis Anacona are confident that jumping on the trend of peer to peer will guarantee their app’s success.